The impetus for Founders Grotesk originally came from Duncan Forbes of The International Office. We had often discussed the nature and usefulness of the classic grotesks, and the possibility of creating a new one. 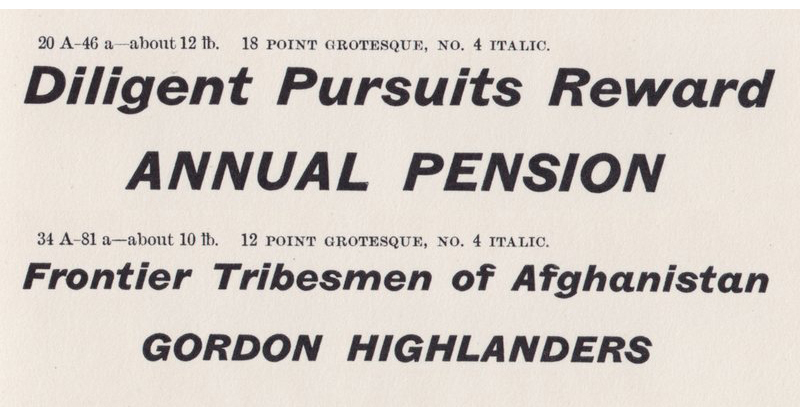 After trawling through my 1912 Miller & Richard specimen, he became enamoured with their series of Grotesques, particularly the No.7 all-caps showing. He noted the appealing rudimentary geometry, the serpentine S, and the narrow but welcome aperture of the C and G. Even though I was aware of these styles, I hadn’t considered their possibility for contemporary interpretation. As Duncan is an excellent graphic designer, he saw potential in the Grotesques. I have learned that graphic designers see typefaces differently to type designers—it is wise to take note when their interest is piqued. One of the decisions revivalists face is which size of metal type to base their design. Before digital type each point size was cut specifically, creating necessary variations in letter shapes, spacing and proportions. Even if a letterform is exactly the same shape throughout every size, ink squeeze and paper stocks would ensure distortion. The example above demonstrates the variety of a single letterform found in the H.W. Caslon Doric No.4 series. The revival decision can be further exacerbated by groupings of seemingly unrelated fonts under a single name, like the above Breite Grotesks from the Bauerschen Giesserei foundry. However, Founders Grotesk is not intended as strict revival—the Miller & Richard Grotesques are simply used as a starting point. Founders Grotesk is a gentle amalgamation of several fonts, resolutely designed for contemporary typographic usage. A key glyph that demonstrates the departure from strict revivalism is the R. The R in the Miller & Richard range seemed slightly too awkward for a contemporary setting, so the Doric No.7 Series was consulted. Due to the lack of large size numerals in the general showings, the dedicated numerics section in the back of the Miller & Richard specimen proved invaluable. Note the fascinating 5, which looks amazing here, but was deemed too anachronistic for Founders Grotesk. The narrow apertures of 5, 6 and 9 harmonise nicely with the C and G.
The italics of the original Miller & Richard Grotesques are wonderfully slanted, they seem serious and daring at the same time. A similar slant has been designed into the Founders Grotesk italics, but there are also many key departures. For example, the spur on g tail, the protracted tail of the a, the curve on the u spur and the kink in the f were all discarded for more contemporary shapes. Top row: Grotesque No.3 compared to Founders Grotesk Bold. Bottom row: Doric No.4 compared to Founders Grotesk Light. The spacing in Founders Grotesk is purposely tighter than any of the referenced typefaces. I have found that graphic designers will happily use a sans serif at all point sizes, often tracking the default spacing to suit the size. As it’s simply not possible to space a single font optimally for all point sizes, I feel that designers can obtain better results by opening tight spacing for text, rather than closing loose spacing for display. Well, I was wrong. 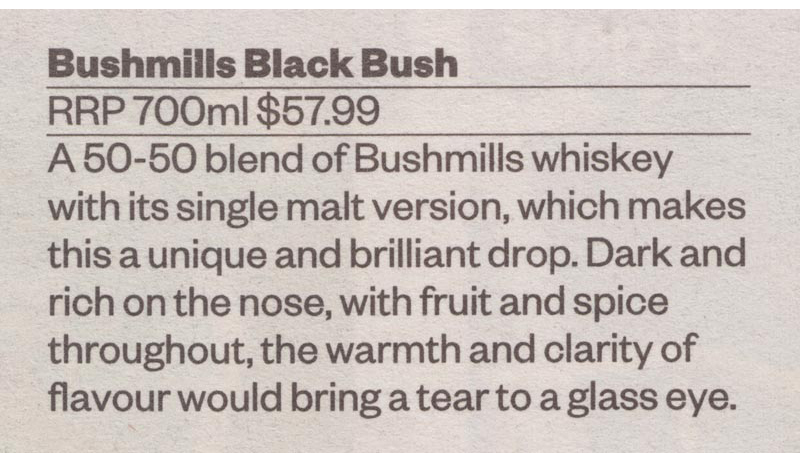 The Weekend Herald, 12 March 2011. Founders Grotesk Bold & Regular, 9pt. Founders Grotesk was originally designed for headlines, but upon it’s first outing—in a newspaper—it was used at text sizes and performed rather poorly. The lighter weights were serviceable at best, but far from ideal. The bolder weights veer pretty close to disaster, almost clogging up completely. Perhaps with a bit of letterspacing and better printing it would only just be passable. 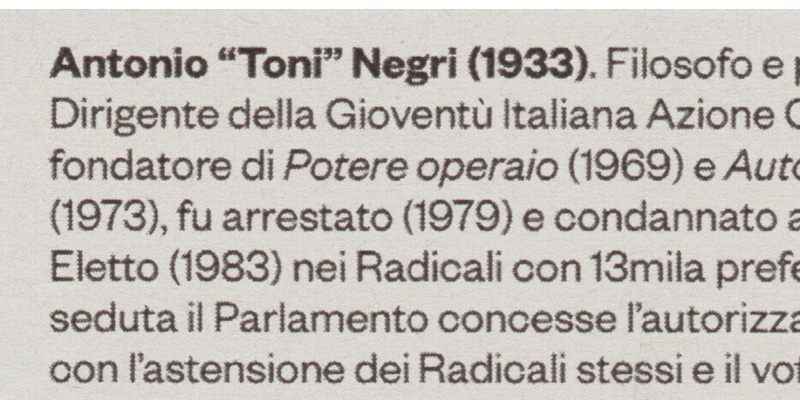 IL Nº 34, October 2011. Founders Grotesk Semibold & Regular, 7pt. 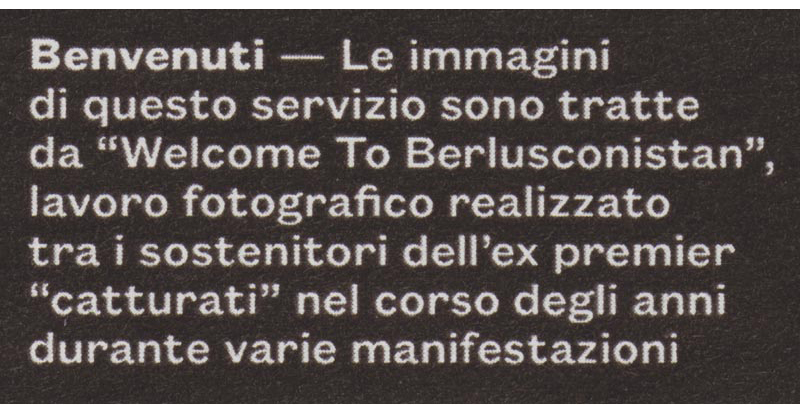 When Francesco Franci used Founders Grotesk (and Tiempos) for his wonderful redesign of IL the same problem surfaced: it was simply failing at text sizes with sub-optimal printing conditions. After discussing our options we decided the best fix was to make a text version of Founders Grotesk. I revisited the source material for Founders Grotesk to seek guidance from the appropriate text styles. The spacing is looser, the letterforms are slightly wider, the details are more open and exaggerated. Almost everything that was too odd or “anachronistic” for the headline styles I could put back into the Text: especially the 5! At smaller text sizes these details calm down and help to service the whole. Now, thankfully, Founders Grotesk Text fixes the problems Founders Grotesk has at small sizes. Overall Founders Grotesk Text maintains the same lineage and feel as the rest of the family, but works best at text sizes. As the typography of IL demonstrates, all members of the Founders Grotesk family can now work harmoniously performing their various typographic roles: punchy headlines, delicate pull quotes, legible body copy and robust captions. Following on from the robust Text styles, Founders Grotesk Mono rounds out the family. As the name suggests it is “monospaced”, each letter takes up exactly the same amount of horizontal space. Like Pitch it is a “10-pitch” typeface: at 10 point it will fit 10 letters to the inch. For more information about monospacing, please read Pitch’s design Information. Typographers have always found narrow widths of sans serifs extremley useful for display work. Founders Grotesk Condensed and X-Condensed are natural companions to the regular widths. They are influenced by the curiously-named Miller & Richard Sans-Serif No.5 series. Of particular note are the square inner counters that contrast nicely with the warm outer curves. Left: Helvetica Halbfett, Max Miedinger, 1957. Right: Founders Grotesk Medium. During the development of Founders Grotesk I was made aware of the enduring qualities of Helvetica Halbfett (Medium). For display typography, the heft and weight is almost perfect. This had quite an influence on me, resulting in a close weight match to Founders Grotesk Medium. However, this is as far as the direct Helvetica influence extends. The initial Founders Grotesk styles were commissioned for completion for the wonderful redesign of The Weekend Herald, lead by deLuxe & Associates. Founders Grotesk Condensed and X-Condensed were completed for The Daily iOS app, and Founders Grotesk Text was completed for IL magazine.